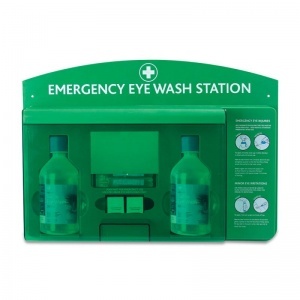 A vital piece of equipment that anticipates all eye-related incidents, the Premier Emergency Eye Wash Station allows for rapid and effectual treatment during situations where the eyes have become irritated through contact with corrosive substances. This robust, dual-purpose first aid provision is perfect for hanging up in workshops, factories, or any environment where chemicals are handled. Use the smaller eye pods to treat mild irritation, or the large saline eye wash to protect against long-wearing damage to the eyes. What is Included in the Premier Eye Wash Station? The panel is easy to wall mount and is made from hard-wearing acrylonitrile butadiene styrene (ABS) plastic with illuminated printed instructions on the front, useful in the event of a power cut so that the station can be easily located. A central mirror has been placed for easy application, with a clear dust-proof cover to keep contents clean. The Premier Emergency Eye Wash Station is usually dispatched via First Class Royal Mail and delivery should be within 1 to 3 working days.